Much fun and a lot of sun was had this past weekend. There was a swim meet on Saturday morning that lasted forever, but it was at "home," the kids swam well, and Cora had a fantastic time eating everyone's food and clapping for all the races. I went home around noon to put the snack stealer to bed and then the meet went so long the big kids had to remain at the pool while James coached his lessons, so they didn't get home until nearly 4 (after arriving at 6:45 a.m. for warm-up). The big kids were still going strong, super pumped about a friend's birthday party at 4:30, but James walked in the door, said hi to me, and then walked to our room and appeared to hit our bed and fall asleep at the exact same time. Shoes on, hat on, and seriously dead asleep. I left him a sticky note in the kitchen with our location and proceeded to the party. We got home at 7 and he'd just woken up. Cora was in her diaper, some beads, and water shoes, so he knew everyone had had a great time. On Sunday we went on a long family walk, he got to swim (for fun, in an indoor pool, though I still don't know how he craves more pool time), and during a magical hour while Cora was napping, I even got in the pool! My new bikini needed a test drive, so I got my full body pool float, kindle (in a ziploc bag for water safety), spa water, and bluetooth speaker playing my beloved Tween pandora station and floated about while the kids marveled at how I was "almost swimming!" They were so proud of me. Then Cora got up and DEMANDED to be in the pool by banging on the glass windows in the sun room and pointing vigorously. She allowed for an outfit change and then walked right in the steps. This is my only picture because I had to immediately grab her when she walked off the second one and spent the next 30 minutes cheerfully trying to drown herself. She had the BEST time. It was adorable. And terrifying. Which pretty well describes Cora. Sunday: steak (for James and me); chicken sausage (the Costco one with roasted red peppers and spinach for the kids because they don't appreciate steak); my new favorite salad (leafy green lettuce, finely sliced green onion, sliced snow peas, cucumber, mandarins, sesame ginger vinaigrette- so good! ); bread. Monday: Pesto Chicken Salad Sandwiches, chips, fruit. Sandwiches were awesome and Cora ate two bowls of the pesto chicken salad. 1. Break 1 (12oz) pkg of vermicelli into 2" pieces. Cook, rinse, and drain. Everyone who has ever had it loves this salad. Our friends are bringing fruit and other sides and then I'm thinking about making dessert, just to make sure we have enough (James and I have high expectations when it comes to dessert quantities)- does anyone have a favorite 4th of July or summer dessert recipe? I'm not big on fruit in dessert (no pies!) which seems to dominate the 4th of July offerings, but am open to delicious suggestions! My barre studio is still closed and I wanted to work out in anticipation of having friends over tonight to eat, drink, and watch our kids burn energy in the pool. I was working from home, so I had some flexibility to start early in my pj's and then head out in search of exercise. James suggested the Y. I always forget we belong, but he swims there and I decided today was my one day a year I make use of our family membership too. And then I got there and decided I should run, on a treadmill. In a gym. I have done this maybe twice in my whole life. Most of the TVs mounted on the wall were set to sports, so I chose CNN as the least boring of the options, popped in my ear buds and started running to my barre play list. And then, about a mile in, I saw "Breaking News Alert: Supreme Court to Announce Gay Marriage Decision" out of the corner of my eye and my heart jumped in my throat. I couldn't believe it was happening and I was going to get to watch it, all because of the stars aligned to get me on a treadmill in front of CNN at 9 a.m. on a Friday morning. I kept running, feeling like I could barely breath and then it was announced: 5-4. And I knew love had won. And tears started rolling down my cheeks. I wiped one, still running, shocked to realize I was crying. And then I couldn't stop. I kept running, mostly because at least then I was facing a wall and not a gym full of people, but I had to concentrate on taking deep slow breaths and not just losing it completely. It was an overwhelming feeling. Joy, relief, and more joy as I watched the faces in the crowd for whom this meant so much. As I wrote on facebook, I may hate running, but I've never actually cried while doing it before. What an incredible day. I finished my run and immediately jumped on facebook, tears running again as I saw all the love bursting from my feed- gay friends, straight friends, family, allies, everyone. My pointer finger was exhausted from all the "liking" and rainbows. As I've mentioned in the past, I've been a supporter of gay rights since my best friend came out to me our junior year of high school. We were 17 and on the phone (he had moved to Dallas a few years prior) and he said, at the very end of our call, "there's something I need to tell you." We'd been chatting out the latest plot developments on The OC, so I was surprised at his change in tone- from upbeat and laughing to nervous and scared. "What?" I said, to my best friend of 12 years. "I'm gay. I mean, I think I am, well I'm pretty sure. I'm gay. I just wanted you to know that." This was 2000. A lifetime ago. Y2K was a recently averted disaster. Gay characters on TV were rare and generally reduced to shallow caricatures. 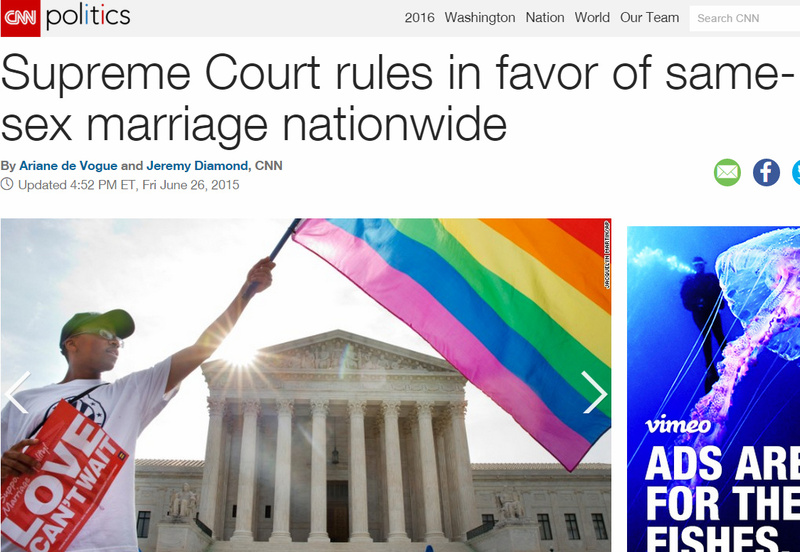 Gay rights and gay marriage weren't phrases you heard often. I lived in an extremely conservative and religious suburb of Houston, so I heard them never. We were talking on our giant cordless family phones because we didn't have cell phones or AOL instant messenger. It was a lifetime ago. And I remember saying something eloquent like, "Okay." Just, okay. Because it was. I think we talked a little more, I probably told him I was glad he'd told me and it didn't matter to me. I asked if his parents knew and he said yes. We said goodbye and I'm sure we talked again soon. It was okay. It changed nothing for me as it related to him, but it shook (and ultimately shaped) so much of how I viewed my world, my politics, my religion, my friends. One of the admissions essays for the Plan II Honors Program at UT was something like "describe a time when your beliefs about something were challenged." I wrote about Sean and our late night phone call. I submitted it and got in to the program, but waited months to show my parents the essay for fear they might think badly of my friend (they didn't, but again it shows how much has changed that I would even think they might). Today isn't about me, but Sean is who I thought of as I read the close-captioned CNN story at the gym. That 15 years after a hushed conversation, he can legally get married in any state in our country. That he can experience that same joy and acceptance and security that comes from calling someone husband as opposed to partner, lover, or friend. When I met James in college I fell head over heels ridiculously in love. Sean met him a few months later and I whispered excitedly that I was going to marry this man and what did he think of him. And I remember thinking then, in the back of my love and lust-filled brain, how unfair it was that Sean couldn't do the same. That he couldn't meet someone, feel the same overwhelming feelings I felt for James, and whisper excitedly to me that it was the man he would marry. And when I did marry James, it was Sean standing up by the alter on my side of the church, a bridesman in a suit with a tie the same color as my bridesmaid's dresses. And again I thought, how unfair that I can't do this for him. "No union is more profound than marriage, for it embodies the highest ideals of love, fidelity, devotion, sacrifice, and family. In forming a marital union, two people become something greater than once they were. As some of the petitioners in these cases demonstrate, marriage embodies a love that may endure even past death. It would misunderstand these men and women to say they disrespect the idea of marriage. Their plea is that they do respect it, respect it so deeply that they seek to find its fulfillment for themselves. Their hope is not to be condemned to live in loneliness, excluded from one of civilization’s oldest institutions. They ask for equal dignity in the eyes of the law. The Constitution grants them that right. It still gives me chills. 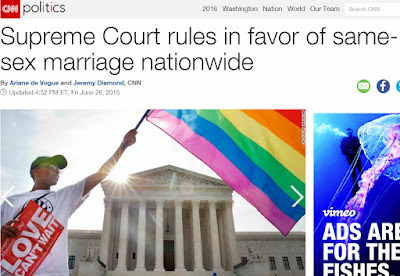 I am so glad my children, my friends, my fellow Americans can marry who they wish. Swim team season is here! Despite my love for swimming as a sport and my own extremely fond memories of summer league as a kid, I was a bit reluctant for Landon to join the team last summer because, in short: I hate giving up my weekends, I didn't know anyone on the team (I actually hung around the wrong team area for a while at the first meet last summer because the fact that I didn't recognize a single person seemed right), and I was going to be solo-parenting 6+ hour meets, 1+ hour away, with 3 kids, including a 7-month old baby. But it was actually fun. REALLY fun. I met some awesome people and discovered my husband is a freaking rock star on the pool deck, even when he's not on it. Once a few strangers in the stands knew I was Coach James's wife, they weren't strangers at all- Cora was held, Claire was entertained, Landon was cheered for, and it was everything I remembered summer league to be. So I was already excited about this summer. Landon had an incredibly successful season last year, going undefeated in both his events up to the Regional Area meet, and it was so fun to watch him do so well and enjoy it so much. And this year Claire would get to join the team! She's the youngest swimmer since she only turned 5 the first week of the season, but she passed her 25 yard swim test and is a proud member of the team. Other promised highlights include Cora dropping her morning nap, James reworking his schedule to avoid Saturday morning lessons, and both kids being on the same meet with practices and meets and the same time! So efficient! We had our first meet two weeks ago and both kids did great. Claire took her events very seriously and even though I know she's a strong swimmer, particularly for her age, she still looked so tiny and the pool looked so long when she dove in for her 25 yard free. She also did the 25 yard backstroke, and while she turned over once when she hit a lanerope and thought it was the wall, she rolled back over and finished the whole length on her back to the end. We were very proud and Cora, who genuinely loves watching other people swim, clapped for her at the end. And Landon, oh Landon, he has a really rather incredible talent for swimming. James and I are both very against pushing our kids to swim, and then even if our kids want to swim, we're even more against letting them join a USS club team until close to high school. We watched too many people burn out, and all the best swimmers we knew, including all our Olympian buddies, didn't do year-round until about 14 years old. And James, for all his intensity and competitiveness towards himself with swimming, isn't intense or competitive at all with regard to our kids in sports. So when we both watch Landon and kind of shake our heads and laugh and admit to each other that holy freaking crap he is really, really good, it's not something we say lightly. I overheard one of the parents in the team area say to another, "Oh, Landon is about to swim! You've got to see this." He has a beautiful stroke, particularly for his age. He won the 25 yard fly too, a new event for him (he's in the 7/8 age group now, so there's a few more options). After some very unbalanced soccer seasons (his coach rarely played him last season and for a bunch of 7-year-olds that just seems ridiculous to me and it made my heart hurt from the stands; swimming is very egalitarian in its clock and even number of event entries), it's just so fun to watch him have this success. Especially when he's so mellow-Landon about it. Cora also enjoyed the meet, mostly because she talked her big sibs out of all their snacks. She loves anything she can do with Landon and Claire. Swim meets are such a family occasion. Though she did get a little tired by the very end. We stopped for pizza on the way home, Cora took a 3 hour nap while James went to coach, and then we spent the afternoon in our own pool, because summer! Cora got another swim lesson and she was not super excited about it. The only time she says "mama" is when James is moving her around in the water. It's like she keeps it in reserve for really serious situations. Unfortunately for her, her dad has literally made his career on ignoring the cries of small children in swim lessons, so they pushed through. Landon helped show her the way. And luckily, she came around. By the end she wasn't even crying and her last two lessons have been great! Though I doubted him ("this is just going to make her hate the water more! "), I was wrong and James was right and I am willing to admit it (on this very specific subject). We've spent every late afternoon for the last two weeks in the pool. Last week Cora just played with her buckets around the edge, but this week she has decided she wants to be IN. In and under. This means I have to abandon my beverage and my book and actually get in the water, which is sad for me, I do love how much she loves it. 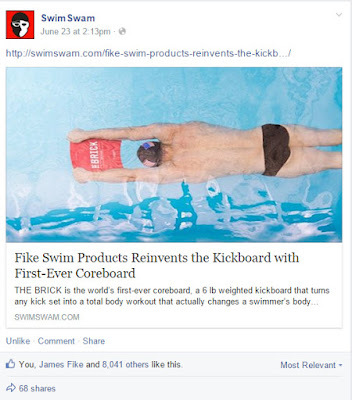 And in other swimming related news, James had a press release for his Brick posted on swimswam.com, a swimming website I wish had existed back when I was interested in the kinds of things posted on swimming websites. It was also featured on the Swim Swam facebook page where it has gotten 8,043 likes so far. 8.043! That has blown our minds a bit- and to think we were all excited at dinner last night because it crossed 300! So hopefully this will translate to lots of new sales. Bricks for everyone! Except Cora. Cora could do a lot of damage with something like that. I love it when you find the perfect card. I found this one at a Paper Source in Santa Barbara in May and nearly squealed. What could be more true? Though I think I'm actually the luckier one because I get to enjoy him as my affectionate, generous, and amazing husband while watching him be an affectionate, adventurous, and amazing father to our kids. On Sunday James got to sleep in until 9 and then, after he opened his gifts (a trio of framed prints of his three company /product logos, i.e., his other children, to hang above his relocated desk in the corner of the TV room), we all went to a champagne buffet brunch at a favorite local restaurant. Buffets are a good investment when you have a James in your party. For the rest of the day he got to swim and I made a cake. A delicious cake. I've been looking for the perfect dark chocolate cake recipe for a while and this is it. I paired it with the Sprinkles vanilla buttercream and it was divine. As was the champagne I drank to cut the sweetness of all the extra frosting I kept eating out of the bowl. It's all about balance. And helpers. I had great helpers. The mini semi sweet chocolate chips on the top added the perfect bit of texture. Our dinner was seared ahi tuna steaks over a fresh salad of chopped romaine, green leaf lettuce, snap peas, cucumber, cilantro, green onion, and mandarin wedges. Delicious! But everyone was really waiting for the cake. Except maybe Cora. She appeared skeptical. But then she crawled in my lap and seemed like she wanted to try some. Now we all joke about how she hated the cake at her birthday, but mostly we've assumed she was just overwhelmed by the moment- we didn't really think she hated cake. It's just a silly running joke thanks to some really awesome pictures my friend took at her party. But no. Cora hates cake. Cake makes her cry the minute it scalds her tongue with its delicious chocolatey goodness. She cried until I used a paper towel to swab out her mouth and remove every crumb from her tongue. Poor poor baby, fed a tiny piece of delicious cake at her request and scarred forever. So weird. Luckily James and I do not have any issues with sugar and ate about half the cake while watching three more episodes of Orphan Black after the kids went to sleep. Save Cora. Eat all the cake. It's a rallying cry. Feel free to take it up on your own. Preferably after making that cake. Cake crying aside (or really, included, because that was a perfect punctuation for the random moments of hilarity and drama that comes with three kids), it was a pretty lovely day for our favorite dad. I hope the dads in your life had a good one too! I am home this afternoon because I had a 10:50 a.m. dental appointment that involved replacing three fillings (the only ones I have, that I must have gotten all at once a million years ago because they all decided to crack at the same time) in three different quadrants of my mouth, and it had been so long since I've had anything other than check-ups at the dentist that it didn't even OCCUR to me that I wouldn't be able to just meet some coworkers for lunch an hour later and then head back in for the afternoon, but oh holy crap NO. Two hours and fifteen minutes post-appointment time I had a racing heart from the epinephrine in the anesthesia and 3/4 of my mouth was totally numb. I'm pretty sure I was drooling. I couldn't feel my tongue which is a very bizarre thing and my lips felt like they'd just had collagen injections, but every time I checked in the mirror they remained their regular rather limp size. So no going back to work then. I drooled my way home and flopped on the couch to watch 3 hours of Brother vs. Brother. I tried to eat some leftover minestrone soup and only felt the soup dribbling out of my mouth when it hit the bottom of the chin. I am that numb. And now vaguely achey in my jaw. Is this why people don't like the dentist? But the good news is I can now sit upright without feeling a pulse in my jaw and I will hopefully be able to feed myself by dinnertime, and AND I get to write a blog update! In the middle of the day! The glass I can't purse my lips enough to drink from is decidedly half full. This morning was an adventure even before I was shot up with the maximum amount of dental anesthesia (red-heads need more pain meds; I proved this today). Tropical Storm Bill hit us on Wednesday and left us with a beautiful rainbow and a less beautiful downed tree limb. The giant limb landed EXACTLY why my beautiful new car Maggie sleeps, so I am very grateful I didn't work from home as I wished I had when I got SOAKED dropping the kids off at camp in a monsoon. Getting soaked to the bone (my jeans were still wet in parts 5 hours later) was well worth not having to file another claim on our poor auto insurance. And, since Maggie wasn't there to be crushed, the limb didn't damage a single thing! It narrowly avoided our garage, our fence, and our house! Half-full! On the downside, it did take out the power lines running from the garage to the house, and the tree guys wouldn't take away the limbs until an electrician dealt with the exposed lines (reasonable, I suppose), so we can't open our garage doors. But an electrician came by this morning and found that yes, that was still a live wire, so now we're just happy no one got electrocuted in the last 36 hours. Half-full again. What a GREAT two days it has been! When the electrician knocked on the door at 8:32 a.m. I was stark naked standing in the bathroom, which was not ideal. I had been trying to shower for the 20 minutes since James had left to take the big kids to swim practice and then summer camp, but just as I stripped Cora ran into the room brandishing two permanent markers like swords. I can't imagine how she got to them as they are usually secured up high on a shelf, but I gently and lovingly yanked them from her destructive hands before she could redecorate the house. Then, as I went to put them back in their formerly secure location, I found her enthusiastically scribbling with sidewalk chalk all over the playroom table. No idea where the chalk came from or why it was inside and not on the sidewalk. I wiped that off and walked back to the bathroom only to find her grinning and clapping and standing fully clothed, shoed, and diapered under the spray of my now warm shower. I picked her up and she hugged me, and then leaned back with a huge smile, like MOM, this has been the BEST DAY! And so we danced in the shower together and I was naked when the electrician came. It happens. Also yesterday, after getting soaked in the rain dropping the kids off in a down pour a half-mile from the parking lot at camp, I went on a surprise job interview! So the fitness studio where I teach barre is having trouble with little things like organization and planning and paying their instructors, so while I hated feeling like a studio hopper I'd already started to quietly feel around for another, more stable position. Then my studio owners had some issue with their lease and I showed up to teach on Tuesday at 5:50 a.m. and the floor was missing, so I taught barre (the barre was still there; I have some standards) on raw concrete. Then the owners canceled all classes after Wednesday and I have no idea what's going on, but multiple long stories short, I found myself crafting a "barre resume" on Tuesday night and was asked to drop by a new studio without warning on Wednesday at 1. Now I haven't interviewed for a non-legal position since I interviewed to be a UT Orientation Advisor in 2001, and the owner characterized the meeting as a "studio tour," so I wasn't sure how interview-y I was supposed to be- should I bring my resume? wish I'd worn yoga pants? be prepared to demonstrate my moves? I took a late lunch and drove to the studio and was duly impressed with the new space and the owner's seeming business sense and professionalism (how nice!). I worked my barre philosophy, how I create the choreography for my classes, and my general love for barre into the conversation and he seemed satisfied. At the end he looked me up and down, a full head-to-toe perusal, nodded, and said, "yeah, you look fit." and then we shook hands and he promised he'd be in touch. I got in the car and burst out laughing. Definitely not the end of my legal interviews, but it honestly felt like such a perfunctory check-mark type of thing I could only be amused at my two very different working worlds. And then I drove back to my legal one to do some research on the extraterritoriality analysis for Section 17(a) claims. Such a weird day. So we'll see what happens there. I just really want to keep teaching barre- I love it so much and teaching has been a fantastic way to keep the classes challenging for me (there aren't many that can make me sweat anymore as a student) and it's so much fun. I love coming up with new series of moves and downloading to music to pair with them. Barre has become the balance for my legal mind that I never knew I needed. And it's fun having a few hundred extra dollars a month and not paying for a studio membership so I can drop in to more yoga classes at other places. So hopefully I get hired. I have new ab moves and I just bought the rainbow yoga pants above and they need to be worn! I have turned into a terrible blogger. SO many things have been happening I should have tons of fodder and yet I sit on the couch at night like a hollowed out shell of myself, barely tapping my finger to flip pages on my kindle and wishing I was already in bed. I know I already said this about last week, but it was another WEEK, all caps, and I am so excited to have this weekend to just chill out and recover. At least now that we're done with our "wake up at 5:30 a.m. to drive an hour for the kids' swim meet that had a warm-up time of 6:50 a.m.". But we are done with that, and tomorrow we will rise after the sun and poor James can maybe spend at least half his day out of the sun's rays. Summer is kind of rough. Fun, but rough. (1) Claire had her 5th birthday party. We had a "Tea Party Pool Party" with of all her preschool friends. There was swimming, then crown making, and then the eating of tiny foods, including cheeses I'd used cookie cutters to shape into crowns, tea cups, and flowers. There was pink lemonade for the "tea" and grown-up pink "tea" for the 21+ crowd. I had an excellent time planning it and the kids had SO much fun. That Sunday was the first day in OVER 40 DAYS that it did not rain. I have never checked the weather report so often as I did the week leading up to it. From epic flooding to gorgeous sunny skies. The universe smiles on the Bear. (2) Claire actually turned 5. Her real birthday was on Thursday and I put out the traditional birthday pig, birthday place mat (originally purchased at the Dollar Spot for a Valentine's Day; things get sucked into traditions so easily around here, I love it), birthday champagne/milk glass, and birthday donut with dad. I adore that she is old enough to be THRILLED over a bag of new maxi dresses and coordinating shoes from her Gigi. ...and young enough that when her brother, who had earnestly and secretly worked on her card while I was making the birthday dinner of "pasta with sauce," presented her birthday card and read it aloud, her face lit up and she asked, "wait, am I really a princess?!" (3) Landon read all the words. Also on Claire's birthday, we had Landon's 1st grade awards ceremony! He got every award there is to receive- perfect behavior, attendance, grades, etc. But the most fun was the certificate each kid gets for how many words they've read for the year through their library books. Apparently the computer tracks the word count of each book they read and pass the reading comprehension test for, and the kids get a certificate with the total at the end of the year. Most kids in the 1st grade classes read between 8-10,000 words, which sounded awesome and made them all smile, and then we finally got to Landon's class at the end and his best friend read almost 45,000 which was amazing! And then the teacher read Landon's and it was 92,466! The principal's jaw dropped and Landon had this little flushed face and grin and it was all adorable. (4) Landon had a birthday party! He doesn't really turn 8 until July, but we'd promised he could have his party before school got out so we wouldn't have to track down his classmates over the summer. He really wanted an "animal party," but they needed to be "real animals mom, not like cartoons" and that is shockingly hard to find. Everything was either too cartoony or too adult (zebra with hot pink; cougar print with gold filigree and red kiss prints (seriously)), but I finally found a few jungle tablecloths, some animal print cups and bowls, and borrowed some solid color serving dishes and a bunch of Landon's animals from his toy bin. I served three kinds of animal crackers and beverages + cookie cake. I've learned to keep it simple because really, the kids are just going to swim and we don't want anyone throwing up. And everyone swam for two hours, I forced them out for cookie cake near the end, and no one threw up! Everyone walked away with tired bodies and a jungle animal bookmark and bracelet. It was a great day. (5) My grandparents stopped over for a visit! My grandparents drive up to Wisconsin every summer to spend a few months at their lake cabin and this time, they stopped to stay with us overnight along the way. The kids were so excited and loved showing off their swimming, reading, and coloring skills. The kids swam and we sat outside and chatted, I served dinner, books were read and balloons were volleyed, and everyone went to bed. They hit the road about the same time I was leaving for work (to give my big presentation on my biggest case! ), which was also the time to take Landon to his LAST day of 1st grade and James had to head to the pool for his FIRST day of the summer session at the new pool with new coaches and lots of new clients. It's like for the past two weeks we can't just have one big thing on the calendar. It needs to be six things. All the things! Everyday. Luckily, we finally stopped having parties and major life events happening at the same time and have spent every night this week in the pool. And by "we" I mean Landon and Claire, though I did actually put a suit on one day and try to get in with Cora, but she started sobbing and clinging to me like a terrified spider monkey. I could barely even take a selfie she was holding on so tight. It was traumatic for both of us. It was a surprising turn of events, but then I remembered she'd had her first swim lesson with James last weekend and it had not gone super well. In the words of Landon, "Mom, she just needs to spend a lot of time around the water so she can lower her anxiety." It's like the's the child of a swim instructor or something. At least maybe she'll now less inclined to throw herself in the water every chance she gets so I can enjoy more chatting with the various friends we've been inviting over nightly. So we're in full summer mode (first swim meet this morning!). The big kids were home with a nanny last week, and are both off to summer camps for the next three. Claire is very excited to join Landon on his summer adventures, and James loves picking them up during his late lunch break and bringing them to his pool for swim practice and dad time. It really all works out rather well, it's just always a little rough getting into a new routine. Next week will be easier, I feel sure of it.